Pop quiz: How did Gray Monk Estate Winery get their name? Read on to find out, wine friends! Gray Monk Estate Winery is located in the Okanagan Valley of British Columbia. Established in 1972 by George and Trudy Heiss, Gray Monk has grown to be one of the most reliable wineries in BC for consistent quality. Don’t take it from me — you’ll hear this from wine lovers soon enough. With over 100 acres of land, Gray Monk makes wines on the spectrum from well known varietals to rare cultivars. I first visited the Estate Winery in May 2012, and fell in love with their wines from the moment I tried their fleet. I particularly enjoyed their Pinot Auxerrois, Riesling, and Merlot. Their Kerner was fantabulous, too. However, their Ehrenfelser holds a very, very special place in my heart. You won’t believe it UNTIL you try it, but this 12.1% abv wine is chock full of goodies. 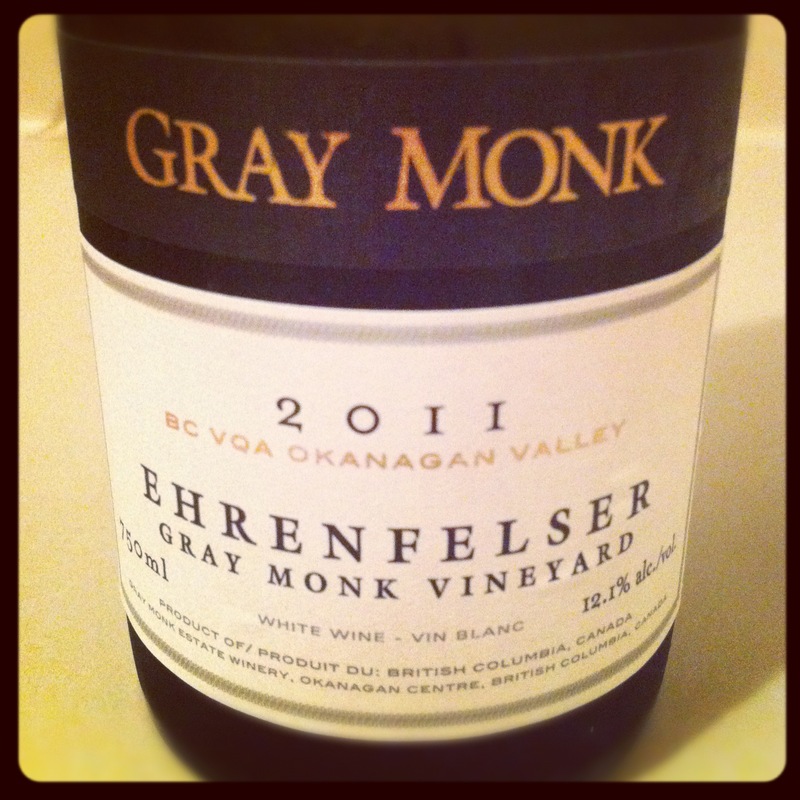 Mildly off dry, with high acidity and carrying good body, Gray Monk’s 2011 Ehrenfelser is … wait for it … stunning. The Ehrenfelser was one of several varieties that came from the Becker Project in the mid-seventies. Since these grape plants were so new back then, we didn’t really know which varieties would be successful. The Ehrenfelser grew very well and the flavour of the finished wine was so big and bold, it made a name for itself. We almost lost them all when we used them for ice-wine production but luckily most of the plants survived. c) a perfect…*pause* I’m sure your inferring skills are kicking in now. Ehrenfelser is a German varietal that was crossed in 1929. A “crossing” is created by making two vitis vinifera vines have babies. It is said that Riesling and Silvaner are the parents, although there has been debates on Silvaner being the father. A rare grape to see grown anywhere in the world today, this fruity white grape is one you should try (in wine form, of course) before it disappears completely. British Columbia seems to be one of the few places in the world with a number of plantings. Food pairings include onion tarts with goat cheese or lighter meats with fruit glaze (ie. pork chops with pear sauce). Our name comes from one of the first grape varieties we produced – Pinot Gris. In Austria and Hungary, this grape is called ‘Grauar Mönch’ hence the translation to ‘Gray Monk’. The grape has a very distinctive blue-gray colored berry.